Myanmar has so far remained the least engaged neighbour of Bangladesh, though it is a gateway to connect Dhaka with the ASEAN countries in the Southeast and East Asia. Its internal politics twined with Rohingya refugee issue are being seen as the stumbling blocks to build the relations. But foreign minister Abul Hassan Mahmood Ali on Sunday offered a list of ongoing and future engagements that he believed would take the relation to a “new height”. Speaking at a conference on Bangladesh’s engagement with India and Myanmar, he said Dhaka pursued a neighbourhood foreign policy and that the relation with the neighbours was characterised by “intensive engagements”. He said a “fresh start” in the relations began with Prime Minister Sheikh Hasina assuming office in 2009 and it continued “to be strengthened and widened in our joint efforts to move ahead”. He said a proposal on Preferential Trade Agreement (PTA) was currently being considered by both the countries, which, if implemented, will help improve the bilateral trade. 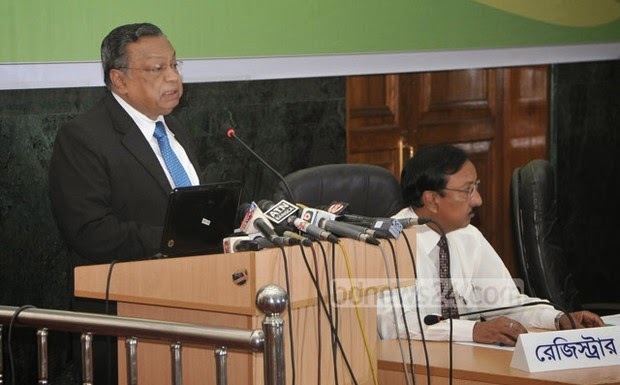 Bangladesh had advantage in some of the industries like the ready-made clothes, pharmaceuticals, leather, ceramics, jute, agricultural products, which the minister said can be exported to Myanmar. In return, he said, Bangladesh can gain from “the abundance of agricultural, natural and mineral resources that Myanmar offers”. “Recently, Myanmar has started to open up to foreign investments and therefore, Bangladesh may also look for suitable investment opportunities in Myanmar. “There is also significant potential for bilateral cooperation in the energy sector,” he said, referring to the prime minister's energy adviser’s visit to Myanmar in early February. The adviser proposed a number of areas for cooperation, including importing gas from Myanmar to produce electricity in Bangladesh and then sharing the electricity with Myanmar. “Myanmar welcomed the proposals,” the foreign minister said. “The power and energy sector cooperation has opened a new window of opportunity for strengthening of bilateral relations. “Another important area of cooperation is the proposed road connectivity that between the two countries and beyond. “It has the potential to establish inter-continental road linkages across Asia and Europe,” he said. Bangladesh and Myanmar already agreed in 2007 to establish road link. Further work is on in terms of connecting the growth centres, ports and key cities. According to the decision of Foreign Office Consultations (FOC) held in 2014, Bangladesh has now prepared and forwarded texts of three draft MOU or agreements to establish formal mechanism of regular dialogue on security issues and maintain peaceful border. Bangladesh has also initiated other processes to enhance people-to-people contact including forging academic collaboration between research organisations and universities of the two countries. “We are working on the visit of my counterpart from Myanmar to Bangladesh soon for the first meeting of the Joint Commission formed during the visit of the Bangladesh Prime Minister to Myanmar in 2011,” the foreign minister said. “Both the countries are optimistic to elevate the bilateral relationship to a new height through mutual visits of the two leaderships,” he said. He said Myanmar server as a gateway for South Asia to connect with the ASEAN countries in the Southeast and East Asia. So, he said, it was also “imperative” for Bangladesh and Myanmar “to continue maintain a peaceful and congenial relationship for enhancing regional cooperation, trade and investment that will ultimately benefit the two peoples”.